There are 2 projects WWT1 & WWT2, each on 1 side of the river. If you're getting to WWT1, you can use the address 308A-308C Punggol Walk. 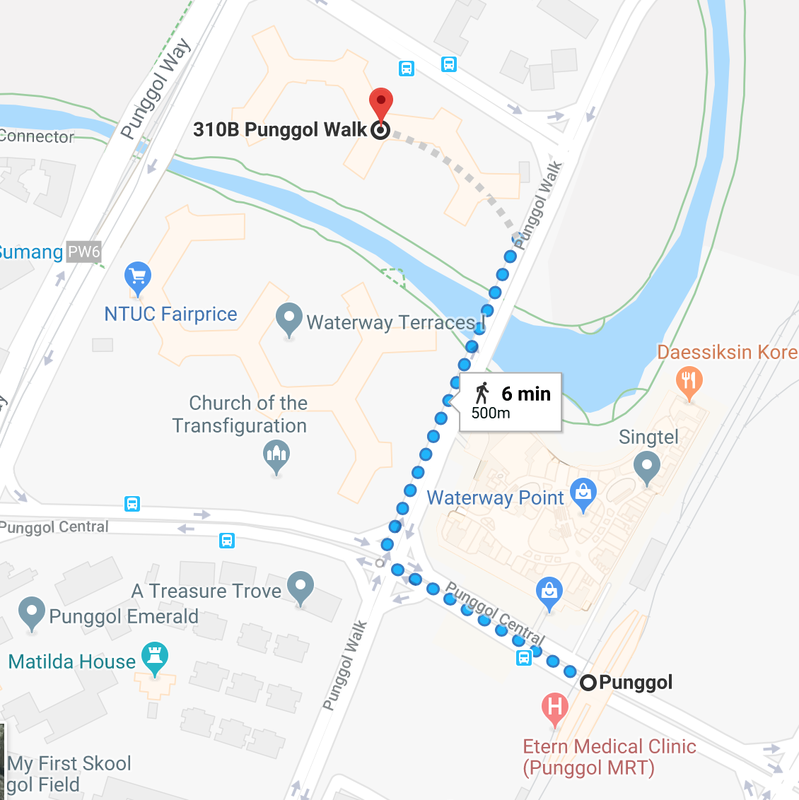 308A is the part closest Punggol Walk & Punggol MRT. 308C is the part closet to Punggol Way and Sumang LRT. There's an NTUC and coffee shop below 308C. 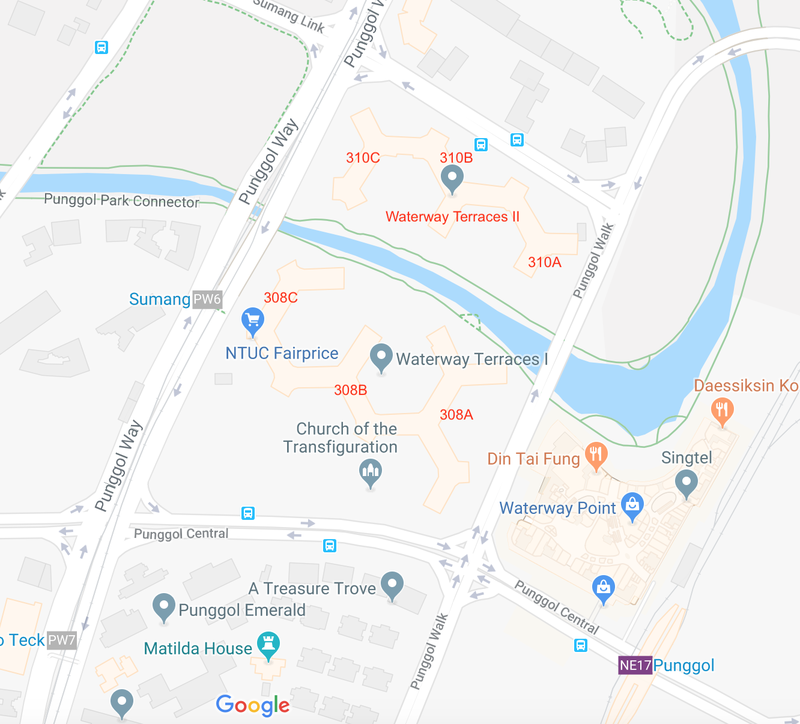 If you're getting to WWT2, you can use the address 310A-310C Punggol Walk. 310A is the part closest Punggol Walk & Punggol MRT. 310C is the part closet to Punggol Way and Sumang LRT. There are drop off points at the various blocks and the carpark is underground. The entire carpark within each block is connected, so you can enter via A-C. Meaning 310A-C share the same carpark. While 308A-C share another carpark. The nearest MRT would be Punggol and you can walk from the MRT over. It would take about 5-15mins depending which block you're heading to and how long your legs are. Upon arriving at Punggol, look for the Waterway Point (WWP) exit. It's located at the front side of the train. When you exit the ticket gantry, WWP will be on your left. If you happen to take the wrong exit, you will end up at the bus interchange that is across the road. You can then cross the road to get to WWP. Then there are 2 options you could take: Easy route or the Adventurous route. This is the straightforward option. Just follow the directions from Google Maps and walk via the main road. You can't really go wrong from here. Upon exiting from the train station, you can walk along the pedestrian path around Waterway Point (the shopping centre at Punggol MRT). You will pass by WWT1 first, or you can continue on to WWT2. This one will be a test of your navigational skill (as well as self-discipline) within a shopping centre. Proceed at your own risk (and wallet). Upon exiting from the train station, you can cut through Waterway Point (my preferred route as it's sheltered and you can get stuffs along the way) but beware of the dangers like Daiso & Koi! 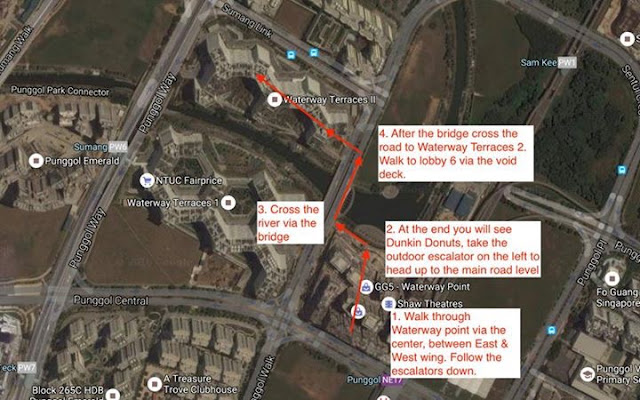 Warning: Walking through Waterway Point may increase your walking time by 100-500%. Please plan your travel time accordingly. a. Walk through Waterway Point point via the centre, between the East & West wing. Follow the escalators down. b. At the end you will see Dunkin Donuts, take the outdoor escalator on the left (just beside Toys R Us) to head up to the main road level. d. After the bridge, cross the road to WWT2. Upon arriving at Sumang, turn left after you exit the ticket gantry. Sumang is located at 308C (WWT1). If you're heading to 310C (WWT2), just walk against the flow of traffic to cross the river via the bridge to get to WWT2.